Bad weather often throws road and rail travel into chaos, ranging from the slow-going to the downright dangerous. If your business is one which can operate without employees on-site, allowing team members to work from home can avoid a dip in productivity while keeping staff safe. DO: Make sure you have a communication plan in place to alert staff members about whether they are required to come in. If you’re allowing remote working, avoid pitfalls by making sure your shared network, remote email access and other systems work in advance. 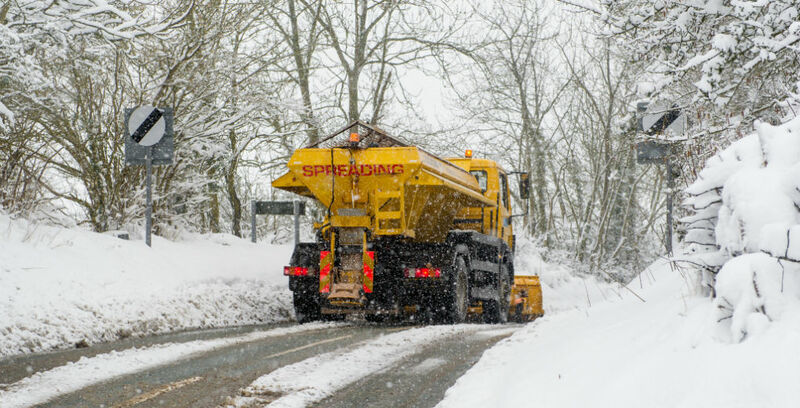 The risk of slips, trips and falls can multiply exponentially during adverse weather – the result of less daylight, icy footpaths and sludgy snow. DO: Prepare by installing extra lighting around your site, especially outdoor yards and car parks. Always grit footpaths, roads and walkways with rock salt before a bad forecast where possible, and discourage short cuts across grass or dirt tracks which can become slippery when wet. Frozen or burst pipes can cause all manner of problems when the mercury plummets. Floods can damage buildings, destroy stock or cause machinery malfunctions, while frozen waterways can result in broken boilers or no water at all – meaning you’ll have to shut up shop until it’s fixed. DO: Leave your heating on a low, constant setting even when the building is empty. You can examine exposed pipework for visual leaks and check for frozen pipes by running taps and flushing toilets. To defrost a frozen pipe, use a fan heater or hairdryer. If you find a leak near electrical appliances, immediately turn the electrics off. If something beyond your control has negatively impacted your business, such as enforced road closures following a burst water main, you may be able to claim on your Business Interruption Insurance.